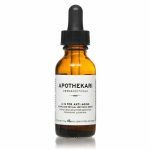 I’ve been using Apothekari’s “A is for Anti aging” product for a few years now and love it! My fair, Scandinavian skin tolerates the retinal levels well and thus, at times, I’ve used it daily. Lately, though, I love alternating it with coconut oil, or with Apothekari’s Vitamin C product, Undercover Agent Serum. All in all, I’ve noticed an improved skin texture (smaller pores, more even tone), fewer blemishes and better oil control.